Mount Merapi, in Central Java, is one of the most important volcanoes in Indonesia, one of the most volcanically active countries in the world. Just north of the ancient sultanate city of Yogyakarta, Merapi has its own extensive mythology. It is believed, for instance, that a shadow sultanate of the spirit kingdom is located inside the volcano. Still, when it erupted in 2010, 353 people died in the disaster, even though 350,000 people were evacuated. Since that tragedy, Yogyakarta has developed one of the most comprehensive volcano management systems in the world, aided by several helpful factors. Mount Merapi is near a major city. It's on the nation's wealthiest and most populous island, Java, and there is a high concentration of scientists and policy experts in the university town. But it's also unique in its combination of grassroots and high-level efforts, from a large volunteer search and rescue squad to a hereditary spiritual guardian who works hand-in-hand with government officials. Mount Merapi, like some other spiritual sites in Indonesia, has a juru kunci, or caretaker, who is responsible for ritual activity and is appointed by the Sultan of Yogyakarta. Merapi's caretaker since 2011 is Asih, also known as Bekel Suraksosihono, whose father, Mbah Maridjan, was the previous caretaker and a cult icon. Mbah Maridjan was famous for his close spiritual connection with the mountain and chose to die in the 2010 eruption while his family and other villagers descended to safety. "My father said, 'please go down. But it will be cowardly if I do so. 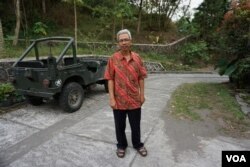 It is my time to go,'" said Asih, speaking from his home at the base of Merapi. "By the time the call to prayer sounded, lava had reached the bunker." Mbah Maridjan died while bent over in prayer. Asih, a math professor at the Islamic University of Yogyakarta during the week, is not quite as committed to the mountain as his charismatic father was. "I am just a servant of the sultan," he said. "I don't feel any particular batin [or spiritual connection] with Merapi. I took my father's title but not his mannerisms." This is literally true: Asih declined his father's honorific "Mbah," which means "mountain guard." The caretaker's evolving role also reflects how tradition and modernity increasingly work in tandem in post-eruption Yogyakarta. "I work closely with the Center for Volcanology and Geological Hazard Mitigation," said Asih. "It's not easy for me to give information to people in the area without panic… the government can do a better job." Today, every family on Merapi has a walkie-talkie. "We respect the local traditions," said I Guste Made Agung Nandaka, the head of the volcanology center. "Also, after 2010, I think people have wanted to listen to science-based warnings, which makes my job easier." He said that today, Yogyakarta's early warning system for volcano alerts combines everything from social media to "mouth-to-mouth knowledge transfer for older people." Asih himself lived in a shelter for six months after the eruption while resettlement housing was built. One big concern going forward? His successor, Asih, only has two daughters whereas the caretaker is traditionally a man. Beyond the spiritual and official actors involved in disaster management, Yogyakarta also has a highly engaged citizenry that compounds their efforts at the grassroots level. The city has an all-volunteer search and rescue (SAR) committee of 2,000 young people who train to help not just disaster victims, but also those who get lost or hurt on the mountain. In 2010, said Endro Sambodo, an SAR member, many of them gave up their day jobs for three months to intensively help eruption victims. "We escaped our reality, but it was very worth it," said Sambodo. SAR works both with Asih and the local government, which gives them a building to use as headquarters. For Endro, the volunteer work is a good tool with which to approach life in the shadow of a volcano, which is a reality for hundreds of thousands of Indonesians. "Indonesia is a supermarket of disasters," he said, cheerfully. "But our ancestors lived here. Most of us still want to live here. And Merapi gives so much to us besides: fertilizer for crops, job opportunities, and now, even tourism." Since the eruption, open-air jeep tours have become a popular addition to the mountain, attracting 3,000 to 10,000 tourists each weekend. There is even a free community school on the volcano's slopes. Yogyakarta is a case study in how a community can manage an on going threat by tackling it from many directions. The mountain is still active; you can see it on clear days from parts of the city. But it doesn't weigh on residents' minds, in part because of their great advances in the past decade. 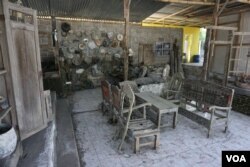 As Sambodo said, "Merapi is a house and we are its guests."